During the feudal period of Japan, men were valued more than women, making it a more powerful gender. This explains why the upper classes including the royal and noble military class were very much dominated by men, although there were, at times, some exceptions. 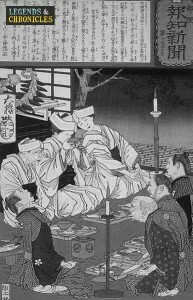 The majority of high ranking people were in fact men during the feudal Japan period. These included the emperors and those who were in the military class including the shoguns, daimyos and samurais, although, at times, some women managed to get to these positions. However, these cases were extremely rare. Men in the noble class followed what was called bushido, which simply means the way of the samurai warrior. The concept ensured samurais were highly disciplined. The samurai moral values focused on loyalty, honor and death. This meant samurais had to be prepared to die for their masters. This concept still exists to some extent in the yakuza culture in today’s Japan. They often committed suicide by slitting himself open in the stomach when rules were broken. This type of suicide is known as harakiri. A group of Japanese men and women dining. Some of the low ranking men in feudal Japan included peasants, artists, tradesmen and merchants, which made up around 90% of the whole population. Peasants were those men who held professions like fishermen and farmers. Although merchants were often very wealthy, they were at the bottom of social hierarchy as they were looked down upon by many. What’s more, merchants were not allowed to display their wealth. The majority of men of all social classes in feudal Japan wore kimonos. However, what differentiated men in terms of clothes was the quality of kimonos they wore and also what they were made out of. Men in the upper class wore silk kimonos often coloured purple, whereas those in the lower class wore less expensive cotton kimonos. Samurais often wore hakamas over a kimono. Hakamas were very much like a skirt. Furthermore, there were two types of hakamas; umanori and bakama. The umanori has divided legs, designed it to make it easy for samurais to ride horses. Bakamas were long length hakama, and were considered smart and worn at court and other formal occasions. Men had a lot more freedom than women in feudal Japan. One of the examples is the re-marriage rights. Women were not allowed to re-marry even after their husbands’ death, whereas men could marry another woman once they had been widowed. two japanese sumo a popular sport even in feudal Japan times. The main food men ate in feudal Japan were fish and rice. There were several different ways fish was eaten, either cooked, mainly grilled or uncooked, similar to what are known as sashimi and sushi today. Some of the popular seafood eaten in the period include tuna, salmon, shrimp, crab, eel, sharks, whales, squid, sea bream and octopus. Even though rice was produced by peasants, higher ranking men had access to more food.